2003 was a wonderfully rich and diverse year for Sci-Fi and Fantasy! 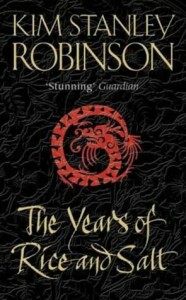 My beloved Locus Sci-Fi Award went to this, Robinson’s Years of Rice and Salt. Gaiman’s superb American Gods took the Nebula. The prestigious Hugo was awarded to Sawyer’s Hominids. The Separation, by Chris Priest picked up the Arthur C Clarke. The BSFA award went to Felaheen by JC Grimwood. McKillip’s Ombria in Shadow, got the Mythopoeic and shared the World Fantasy. The other co-winner of the World Fantasy was The Facts of Life by G. Joyce. Eight awards – eight different winners. How often does that happen? I was pretty cautious before starting The Years of Rice and Salt. I’d only read one other Robinson before – Red Mars, many years before – and found it tough going at the time (but that’s another review). I chucked this into my suitcase for my honeymoon, content that if it was too much of a grind for around-the-pool reading, my wife was packing plenty of lighter fantasy fare I could borrow. My fears were all for naught – this is totally different kettle of fish to the Mars Trilogy. Alternative history premise: the black plague obliterated Europe and the Eastern civilizations scrap over global conquest. Story lens: reincarnation! A small family (?) of souls reincarnate in different forms and relationships with each other over ten novellas covering seven hundred years in a great karmic cycle. I like Buddhism. I like alternative histories. I like the interlinked novella approach. For holiday reading, this was perfect. I devoured a novella every time we took one of Malta’s quirky buses to a tourist trap. I sipped at them leisurely while lounging on the beach. I chatted about the wonderful ideas with my new wife while we enjoyed room service on our balcony. I loved the little between-life moments of the reincarnation. 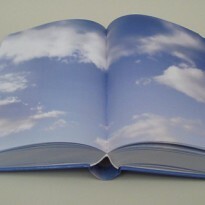 By turns this book made me excited and tranquil. It reminded me a little of David Mitchell’s brilliant Ghostwritten with a touch of Wilbur Smith in each little adventure. It was one of those books I didn’t want to end. Surely there could be one more reincarnation? One more story? I’m surprised by the number of negative reviews I’ve found, I guess it helps that I’ve always held Buddhist inclinations. I give this five-stars without hesitation. Not long after we returned from our honeymoon one our cats, Callie, escaped and was killed on the road near our flat. She was the prettiest, most affectionate kitty I’ve ever met – adored by all who met her (even dog people). When I found out that she had died, it was this book that came to mind. One of the stories involves a soul 'demoted' to a life as a tiger for one cycle. I told my wife that Callie “was just too good to be a cat and they had to call her spirit back so she could be reincarnated as a person”. The idea was comforting. Those words were still in my head when, very shortly after, I discovered we were having a child. When I look into my baby son's eyes now, I wonder if, just maybe, there’s a bit of Callie's endless curiosity looking back. That makes me happy.